his text gives students a clear and easily understood introduction to entropy - a central concept in thermodynamics, but one which is often regarded as the most difficult to grasp. Professor Dugdale first presents a classical and historical view of entropy, looking in detail at the scientists who developed the concept, and at how they arrived at their ideas. This is followed by a statistical treatment which provides a more physical portrait of entropy, relating it to disorder and showing how physical and chemical systems tend to states of order at low temperatures. 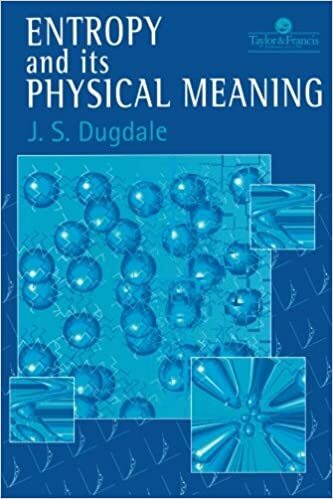 Dugdale includes here a brief account of some of the more intriguing manifestations of order in properties such as superconductivity and superfluidity.Entropy and Its Physical Meaning also includes a number of exercises which can be used for both self- learning and class work. It is intended to provide a complete understanding of the concept of entropy, making it valuable reading for undergraduates in physics, physical sciences and engineering, and for students studying thermodynamics within other science courses such as meteorology, biology and medicine.